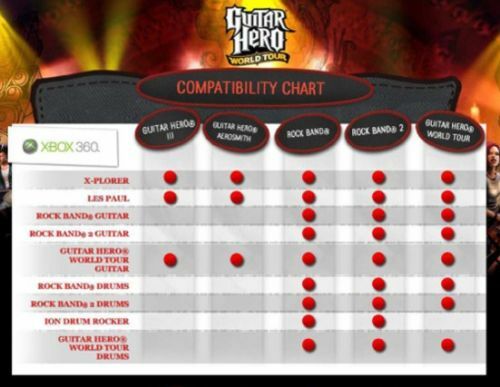 Co-Optimus - News - Guitar Hero/Rock Band Instrument Compatibility Chart - Yanked? Just a few days ago, the folks over at the Guitar Hero World Tour community site posted a set of charts. The charts show which instruments work in which games, for both Activision's offerings, and those of competitor Harmonix. (It'd be better for gamers if there was no need for such a chart, but I digress.) Obviously, knowing which instruments to buy for maximum compatibility is important this busy, hit-packed season. However, there are a few problems and inaccuracies with the charts, as you can read about in Wired's post. In a somewhat shocking turn of events, the official post from the GH community forums with the charts seems to have disappeared; at the very least, it has been moved and the links are broken. (If you can find it, please let us know by posting here!) Curiouser and curiouser, as a certain young lady once said. In the meantime, if you need to know if that PS3 Rock Band drum kit will work with Guitar Hero World Tour, or if your old reliable X-Plorer will allow shredding with your buddies in Rock Band 2, we suggest Joystiq's Instrument Compatibility Matrix. It's quite an impressive piece of work, and goes to show you sometimes the fans know better than the publishers!